This simulated image provides a look inside the SpaceX Interplanetary Transport System for sending humans to Mars. "There's no technical obstacle to the plan being executable," space policy expert John Logsdon told Space.com. "SpaceX has good engineers. They don't have to really invent much." Right now, SpaceX is flying nonhuman payloads for NASA and other customers, using the company's Falcon 9 rocket and Dragon space capsule (both built entirely in house). SpaceX is scheduled to start flying astronauts to the International Space Station for NASA as early as 2017. 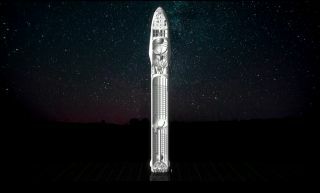 The company is also working on a larger rocket, called the Falcon Heavy, and representatives for SpaceX have said they would like to use the rocket to send one of the company's Dragon spacecraft to Mars as early as 2018. The Falcon 9 has a reusable first-stage booster, which, instead of falling into the ocean and being scrapped after a launch, uses a set of thrusters to reorient itself, and three of its engines to lower itself down onto a landing pad. SpaceX has demonstrated a series of successful booster landings, although the company has not yet reused any of those landed boosters. That landing technology would likely be used to lower spacecraft onto the surface of Mars. A simulated view of the SpaceX Interplanetary Transport System traveling to Mars, using solar panels to gather energy. Logsdon said he thinks the main obstacles to SpaceX's Mars plans are money and time. In addition, Logsdon said that while Musk's plan seemed to explain how humans would get to Mars, there was a significant gap in planning as to how those spacefarers would establish a colony on the Red Planet. Technologies and procedures for surviving on the surface of Mars are, at best, still in the early planning stages. Supporting such a huge influx of people will require food sources, an economic system and energy supplies, which Musk did not explain, Logsdon said. "He got a little hand-wavy there," Logsdon said. Because of the huge amount of funding a plan like this will require, SpaceX can't do it alone, Logsdon said. They'll need significant sources of funding, and NASA will likely be one of those sources, he said. As a result, it's very possible that NASA's plans to send humans to Mars will converge with SpaceX's plans, Logsdon added. Some people are already breaking down the technical specifics of Musk's plan. Those experts include Robert Zubrin, leader of the space advocacy organization the Mars Society. "In his talk today, Musk presented a number of interesting and very useful ideas," Zubrin wrote on the society's website. "I don't think they are practical in the form he presented them, but with a little modification, they could be made practical and very powerful." Ahead of Musk's talk on Tuesday, SpaceX representatives announced that the company is working on a rocket engine that would run on methane/oxygen propellant, which the company determined was a more readily available fuel on Mars. "He's right on the mark about using methane/oxygen propellant, which can be made on Mars, about making the spacecraft reusable and refillable on orbit," Zubrin wrote. However, Zubrin criticized Musk's plan to send one large propulsion system all the way to Mars, instead suggesting a system that would send the spacecraft toward Mars, but remain in orbit around the Earth. "Musk's mega-Mars plans are welcome news," Leonard David, author of "Mars: Our Future on the Red Planet" (National Geographic, Oct. 2016) and a longtime Space.com contributor, said in an email. "But it is clear that there's far more needed in terms of technological and financial detail before climbing onboard his dream machinery." "There are a number of 'DUD' (doable under duress) factors that must be dealt with before a true settlement on Mars becomes realistic," David said. Examples of DUD factors are "the types of machinery and power levels needed to run equipment for transforming the abundant resources on Mars into usable, life-supporting and sustaining supplies," he said. Elon Musk, founder and CEO of SpaceX, outlined the company's plans to colonize Mars, speaking at the International Astronautical Congress meeting in Guadalajara, Mexico, on Sept. 27, 2016. Image taken from a SpaceX webcast of the event. The experts we talked to also agreed that Musk has certainly managed to inspire many people, both in the industry and in the general public, about space exploration. Logsdon said the atmosphere in the room during Musk's talk was "like a rock concert." "His extraordinary vision and passion is tugging at the adventuresome spirit of humankind, at least those who hunger to be part of a plan that assures our species becomes multiplanetary," David said. He later added that "Musk has served notice that building the bridge between the third and fourth planets in our solar system is an attainable and realizable goal." Chris Carberry, executive director and co-founder of Explore Mars (a nonprofit created to advance the goal of sending humans to Mars within the next two decades), told David via email that "this announcement is likely to grow enthusiasm for humans on Mars tremendously. "I think it is important, however, for SpaceX to articulate in more detail — over the next few months — their funding mechanism and how they will overcome the many technical and physiological challenges," Carberry said.